Over 20 years ago at the age of 25 I decided I was out of shape and aging faster than I wanted to. I started getting in to running. I went out and bought a pair of “cross trainers.” Now anyone who is reading this that considers themselves a runner knows that you can’t be a runner in cross trainers. I was green and in those days I didn’t even know what questions to ask. I started out humbly, not even able to run a mile. I bought my first pair of running shoes and eventually I got up to where I could run three miles without falling down. I thought I was in great shape. I entered by first 5K. 3.1 miles. I was an athlete now! I could do this. I ran 27:56. Which if you are not a runner is precisely 9 minutes per mile. I thought that was awesome. I got beat by old ladies and guys who had a hitch in their giddy up. I had no idea how slow I actually was. I was embarrassed and determined to get better. Eventually I ran a personal record of 22:47. Not many years after that first 5K, I read an article about training for a marathon. It didn’t sound that difficult. So, just a month after my 31st birthday I ran my first marathon and followed that up with a second marathon the following year. So 14 years after that second marathon, what am I doing on a country road 8 miles into a 17 mile run and seemingly in pretty damn good shape? Well that is another story that will wait for another time but I did begin to contemplate what I have learned from running and why I felt relatively good for an old man training for his first marathon in over a decade. It’s easier to run a marathon than it is to train for one. Marathon training is long, boring runs on early Saturday mornings with no one cheering you on. Marathon courses are usually lined with people and other competitors and they give you food and drink along the way. You don’t get that in training. The lesson: The hard work is usually done behind the scenes. What gets you to the show is the practice, the studying, the time you have committed to your goal. 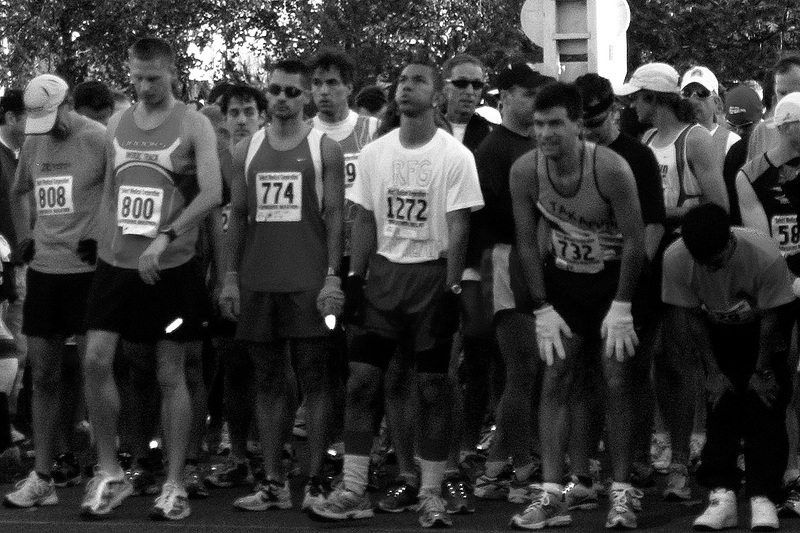 Running a marathon is mentally more difficult than it is physical. Sure, there are morning when I can’t walk down the steps because my calves are inflamed. There are nights when I can’t sleep because my hips hurt so badly. But the worst thing is allowing your brain to convince your body that this won’t kill you. It takes a strong, positive mind to get yourself out of bed on a cold Saturday morning, hit the road and keep moving. Lesson: Much like above. There are times when you are working towards a goal and you just want to hang it up. It gets too hard. Your professor tells you that you’re not good enough, your family and friends think you;re nuts. The reality is that this is your goal and your work. You get to decide whether it is worth it or not. And you can decide that its not but let it be your choice. Running hurts and running fast really hurts. Sometimes you have to run fast or do harder workouts to get better. You may get better at these workouts but they will never get easy. Running repeats on a track, doing hill repeats, running 17 miles will never be characterized as easy. Same goes with life. If its getting easy you probably aren’t doing it right. If you are spending too much time in your comfort zone, you are not getting better – at anything. On the flipside, sometimes you have to go slow. We are in training, we don’t need to kill every workout. Some workouts are for developing stamina and those workouts are slow. Slower usually than marathon pace. Same goes for life. You also need to take the time to relax and enjoy life. Six minutes miles will get you to the finish faster which is good in a race but probably not in a life. Training for this marathon I feel much better physically than I did 14 years ago and I’m running the same if not slightly faster pace than I did back then. In fact I have run personal records at every distance but the 5K in my 40s. Getting older apparently has its benefits. I have already made the mistakes. At 25 I didn’t know what questions to ask. In my 30s and now in my 40s I have made the mistakes and learned from them. I have asked the questions and had them answered. The lesson is that there really is no replacement for experience. Easily the best teacher in many ways. Experience doesn’t necessarily mean that you learned it on your own but it means that you have learned what to ask, where to look for answers, and who to give your trust to.